I have posted this in another thread. But since the graph tells quite a story, it deserves a thread of its own. So, naysayers, have at it. Explain why the polls were correct to within .12% on average in 2000 and were so far off the mark this time. You don't have to respond right away. We know you need time to determine the spin cycles necessary to attack this one. Inquiring minds want to know what you think. And you guys are so very creative in your rebuttals, you can sell ice to eskimos and firewood to the devil. And a Strawman to the Wizard of Oz. Oh, but do us one favor. Please try not to spin too much. It gets kind of drafty and we don't want to catch cold. 1. Here are the numbers, straight from the MSNBC site. The final 2000 exit poll numbers which have been weighted, and 2004 numbers from 4pm that are incomplete. If you're not using incomplete data from 2004, enlighten me. 6. I use the only data I have for 2004- thats 63% of the final total. But 71,000 (out of 113,000) is a pretty fair sample size, don't you think? I can hardly wait for the rest. Do you have any idea when the data will be available? I have heard that there is some kind of problem holding them up. I think Conyers asked for them. Oh, one other thing. How come with all the talk about NPR/Mitofsky exit polls being unreliable, no one has bothered to look at these numbers? Not a peep. We have been focusing too much on Florida, I think. Is there anything in these numbers that presents a problem to anyone? After all, this is from the PRIOR election, which Bush ran in. I would think the exit polls would be of interest. if you are such a propenent of massive fraud by the GOP, then why do you presume that the data from 2000 on MSNBC's site is any less "tainted" than the final 2004 data they have posted now? they did not have, nor did they need, the infrastructure they have in place now. They have learned from 2000 that must get MORE than the minimum required to win the Electoral vote, which was the goal in FL 2000. This fraud was massive. This was not just Florida. Gore won the popular vote, no? But they still were able to steal Florida. They did not need to deal with exit poll problems - except for Florida, which we all know Gore won by at least 50,000 votes. This time, Bush needed a mandate. He needed to win the popular vote solidly in order to remove any doubts about his legitimacy. Now that the BushCo infrastructure has been in place for four years, the exit polls assume more significance. You can't steal 3-5 million votes and expect the exit pollsters not to notice. I'm surprised they even allowed exit polling this time. Maybe they really thought they were going to win. But, trit, I'm sure you know all this. Why am I repeating what you already know? impossible with the two numbers. You would either have to compare the complete weighted data from '00 and '04 or the incomplete unweighted data for both years to formulate a comparison. The '00 unweighted incomplete data may have been just as off as '04, and I guess given the early "wrong" calls then('00), they probably were very similar. 32. The early BS calls for Bush in FL were due to the Volusia scam. Remember Vousia Cyt? 16,022 Gore votes mysertiousl scattered around to 3rd party candidates. The original calls for Gore were correct. Gore won FL by 50,000 votes, but 175,000 punched carss were spoiled in minority districts. The so-called exit poll discrepancy in 2000 was a canard. JOHN ELLIS AT FOX NEWS WAS THE FIRST TO CALL FL FOR BUSH, KNOWING THE FIX WAS IN. 33. That's a very good point. But, I don't think that means that we can compare raw unweighted numbers from one election to final weighted numbers from another and expect it to derive the evidence of any significant conclusion. 39. How do you know that the polls were unweighted? If the networks use early exit poll data to call elections, why should there be a problem with that? Does it take Mitofsky/NPR 3-6 months to weight the numbers? Is that why they won't release them? Come on, its been almost 8 weeks. And what about the 71,000 exit polled and released prior to 8am? That's 63% of the 113,000 total to be polled, and is a pretty heavy weight all by itself. Bush needed to win 56% of remaining 42,000 to reverse the 51-48 spread from Kerry to his favor. Forget weighting for a moment. Do you really believe that a 15% Bush turnaround from the first 71,000 (counted, where he had 48%) to the final 42,000 (not yet counted, where he needed 56%) was possible? The numbers were leaked without proper weighting. The thing that I think you have to consider is that his exist polls were design to project a winner, not determine fraud. Two different animals in the way the polls are constructed and put into practice, at least according to Mitofsky. And since we are using his numbers his input has to be taken seriously. "And what about the 71,000 exit polled and released prior to 8am? That's 63% of the 113,000 total to be polled, and is a pretty heavy weight all by itself." Not if the numbers are not weighted correctly due to sample differences. That can take a little while to determine whether you have samples 59% women, or 59% men in a given polling place, and how to adjust them to reflect a predictable outcome. Evidently sometimes it takes too much time if the voting is close. Forget weighting for a moment. Do you really believe that a 15% Bush turnaround from the first 71,000 (counted, where he had 48%) to the final 42,000 (not yet counted, where he needed 56%) was possible?" The way I understand this you can't forget weighting because the raw numbers are only representitive of whom you were able to take the poll. Without weighting you could take that same 113,000 and if they came from a certain precinct that was heavily one candidate or another it would skew the results. In the polls the weighting is everything. If you had a definite random sample then your conclusions would be correct about the unheard of 15% turnaround from the first 71,000. But that obviously wasn't the case according the the man who did the poll. I think your analysis has been interesting and I think one could actually find some factual abnormalities if we had the complete data. I just think that with what we have it is near impossible to make a conclusive judgement. I hope you have a Happy Holiday's. been weighting the data all along before sending it to media (CNN) to post? This issue was frustrating me the other day in another thread when someone posted the WaPo article indicating that national raw exit poll data had trended toward Dems in the past 3 Presidential elections. WaPo must have gotten the raw data for that article from the polling companies, because professional pollsters would always adjust the data before giving it to the media to present. It makes sense that raw data usually skews Dem because often pollsters, concerned about getting an adequate size minority sample, poll almost as many minorities as others -- before shipping the data to anyone -- early in the day, mid-day, or late -- they would adjust their numbers taking this into account. Again, wouldn't the exit poll companies been weighting the data all along before sending it to media (CNN) to post? The biggest deception about exit polls this year is that 'adjusting' meant mixing in vote totals during the evening -- it did not mean what 'adjusting' has always meant in the past when referring to exit polls. that the media outlets that subscribed to the exit poll data had access to the data all day as it came in, just as Mitofsky did, and they were warned all day that the preliminary data was unreliable and should not be used for news coverage. is using is the data that was on CNN (and other media) websites that night from roughly 7 or 8 p.m. until about 12:20 p.m. -- the exit poll server went down for about 3 hours so the data did not change during that period of time. This isn't 'raw data' - it has already been adjusted and is ready to be reported by the media. based on the male/female splits. I make the assumption virtually 100% of the respondents are one or the other. I also calculated the 2 party vote to keep the good red apples with the good blue apples. I didn't want to soil the crop with Nader et al. It took a fair amount of work, doing all 50 states. I hope it was worth the effort. I should have numbers for you tomorrow on how they fixed the final exit polls in 2004. The red states were fixed to show Bush having a huge early (1 month prior to election) lead that was insurmountable. The blue states were fixed showing a Bush surge in the blue during the last few days, in order to cover up that, in fact, it was Kerry who was surging during the last 48 hours. Nationally, the exit poll has last-day undecideds going only 52-45 for Kerry. This is total BS. It was closer to 60-40 or 62-38, but it would have been very hard to explain a Bush victory with those kind of numbers. 30. Holy smokes -- I THOUGHT SO! I thought the pre-election polls were being massaged to show much stronger Bush performance than was true. I also think that the NEP exit polls (even before they were contaminated with tabulated votes) were massaged to be pro-Bush. The only 'correction' of the exit polls has been the MSNBC correction of exit polls for Latinos -- they admitted that they had included more rural/pro-Bush Latinos than exist in the general population. If you want the link, I can dig it up for you. to expose the GOP as the criminals they are! You're amazing ... a lot of hard work went into your research, and believe me, I for one truly appreciate it. Don't stop now ... we need your voice! Thanks for putting it all together like this! TIA -- you are a hero! Thanks so much for all of your work -- and continual research. this is very interesting, I believe there are very good information in those polls even if they are more or less flawed. I am not naysaying, I think the circumstancial proof alone can tell us there was massive fraud. Intentional lack of security in the vote machines, and the election results from New Mexico. Would you care to elaborate a little on the relative credibility of the exit polls data you have? I read the Calthech/MIT voting lab addendum to their initial entirely flawed report, they operate with different sets of data, although they don´t really elaborate on any of them. You seemingly say something about it, but as I got it the polls have a weighting system in them, ref the "oversampling women" rebuttal of the initial "official" exit polls problems. The idea is to be sure you sample young people as well as old, all the relevant groups in the population. I think you also determine the gender balance during the early testing and factor it in at the end. This would seem to argue against your sample being good, although it seems the proportions wouldn´t attribute to a removal of the trend you describe. How do you view the sample versus the weighting methodology? Some of the 2000 data is very far off. Is there historical or other relevant explanation to this? A good explanation of one of these cases would help. 9% is very far off, I believe it is way outta margin of error. If the exit polls have methodical failures they are IMO not usable as proof, although they serve as a nice indication. 1)There has been a concerted effort made by the media to hoodwink the general public into believing that exit polls are inaccurate, even though all historical evidence is to the contrary. 2) In the data which was downloaded by Simon and released by SCOOP at 12:20 am on Nov 3, 71,000 out of an anticipated 113,000 were already polled. That's 63% of the total sample. It was a large enough sample for us to assume it accurately represented the voting population. I explain why below. 3 Kerry was leading by 51-48% at 8PM, as most journalists were led to believe,then Bush needed to win a very large majority of the 42,000 remaining to be polled to reverse the result. 4) NPR/ Mitofsky not released the raw data. Why? Could it be because it would confirm a Kerry win? Occam's razor would seem to apply in this case. 5) Cal-tech later debunked their own initial polling analysis, after they learned that the data they used was not the data which Simon downloaded, but was in fact "massaged" around midnight. The data was "massaged" (that is an understatement) to supposedly "match" the recorded votes. Think about that for a minute. Polling data was manipulated because it did not agree with the votes. Does that make sense to you? 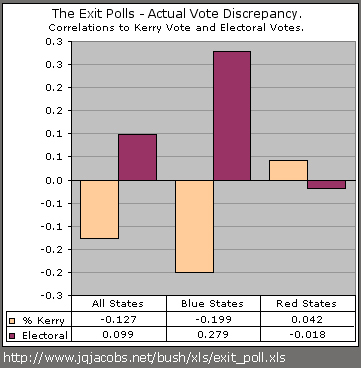 5) The fact that 2004 exit polling deviated far from the actual votes has never been explained. Let us use a little bit of statistics and some common sense here. Let's stipulate that exit polls have proven to be much more accurate than pre-election polls. That is a fact. 6) People may not know at the time they are polled prior to an election who they WILL vote for (they may not even vote), but they sure know who they HAVE voted for after the fact. 7) The MOE calculated below for various sample sizes are actually conservative since they are based on standard pre-election polling. 8) There were 71,000 respondents polled by 8PM on Nov 2. 9) Here is the MOE calculated for N respondents. The formula is very simple. The MOE= 1/sqrt(N), where N is the sample size. The MOE is equal to 0.38% for the initial 71,000 poll sample (63% of the total). It is equal 0.30% for the full 113,000 polled. The MOE= 1/sqrt(N), where N is the sample size. THE 71,000 POLLING RESULTS (63% OF THE TOTAL) IS AN OVERWHELMING SAMPLE. I WOULD NOT EXPECT THE REMAINING 42,000 TO DEVIATE FROM THE RESULTS BY ANYTHING MORE THAN A VERY SLIGHT AMOUNT. THAT IS THE LAW OF LARGE NUMBERS. THAT IS THE SAMPLING ERROR OF THE MEAN. YOU CAN SEE THE LAW OF LARGE NUMBERS TAKE EFFECT CLEARLY IN THE CALCULATION OF THE MOE BASED AS THE SAMPLE SIZE INCREASE. WITH 71,000 POLLED, WE HAVE ALREADY CONVERGED ON THE SAMPLE MEAN TO WITHIN ONE PERCENT. THE RESULT WILL FALL WITHIN THE MOE 95% OF THE TIME. WE HAVE ALREADY PASSED THE MARGIN OF ERROR POINT OF NO RETURN. FROM 71,000, THE DIFFERENCE IN THE SAMPLE POLLED BECOMES A MOOT POINT - THE LAW OF LARGE NUMBERS HAS TAKEN OVER. As I said before, I am not a pollster. I do have three degrees in mathematics. I have developed quantitative programs for MANY years. I am an Excel expert. I always strive for the truth. No one is paying me a dime for what I do. I never expect to capitalize on this analysis. I just want to present the facts to the best of my ability. The truth about this election is being hidden from the public. The media lock down and spin is tantamount to treason. I have made mistakes in my probability calculations, but they were not far off and were fixed. No one has disputed my final result. 22. The math seems sound, but I have a question on your conclusion. Can't you get a result like the one you've shown from bad polling, such an influx of voters from Jesusland that polsters didn't account for? 34. I won't respond to that Jesusland strawman. I assume you are unaware that MOE applies to exit polls as well. 1) Individuals are polled immediately after voting and KNOW exactly who they voted for. They don't lie. They are not undecided. 2) Exit polls typically sample over 2000 in bigger, hotly-contested states. For example, 2,846 were polled in FL in the initial polling (63% completed). More samples mean lower MOE's. That's it. It ain't rocket science, although Mitofsky would like you to believe so. Why won't he release the complete exit poll data? Maybe for the same reason Bush won't release the full 9/11 report. Maybe for the same reason nothing is neing done about the Plame indictments..
Maybe for the same reason nothing is being done about the Abu Grhaib violations of the Geneva Conventions.. Isn't the sample pool the precinct population of voters and the sample size the number of respondents at the precinct level. Shouldn't the MOE be calculated at this level? Each precinct will have a different MOE based on the population size and the sample size. Granted, there are concerns when they all tend in one direction. Maybe something is flawed somewhere in the methodology. It is reasonable to look into this in greater detail. The number for my Quantitive Methods graduate seminar instructor must be here somewhere!! 35. Not quite. The MOE is strictly a function of sample size. If you sample N people, whether from a Precinct, County, State or Nation, the formula applies: MOE = 1/sqrt(N). It is a function of N only; there is no population size variable. Most people, as I once did, think intuitirely that the poll sample size must increase depending on the population size. THE POLLING MOE IS INVARIANT OF POPULATION SIZE. ONLY THE SAMPLE SIZE MATTERS. Of course, depending on the precinct demographics, the polling sample may need to take thse characteristics into account. I am not a pollster. I cannot go beyond this. 40. Precincts are being sampled. They are the population size. The rest is in the methodology of aggregation. And the precincts used are just samples of all the precincts, selected by some hopefully correct and justifiable in hindsight pre-determined criteria for their presumed representational value as part of a whole. This is based on past experience, demographics, etc. And this election did not follow past patterns. Look at the record turnout. You cannot expect that the deterninations of where to sample will be accurate. So samples of samples are under consideration, only partial samples of the pre-selected precincts to sample at that. At the precinct level with only part of the sampling complete, you cannot expect the results to fit the design criteria. The MOE will be greater than when the necesary N is reached to fit the methodology. Can you say if the partial results are a giveen percentage of each precinct, a given percentage of the precinct, a different percentage of each precinct, a different peceentage of the precincts in each state? Can you say if the precincts had the expected turnout percentages? can you say if the states had the expected turout percentages? Do you have the specifics of the model and methodology employed by the poll? Can you say if they just took the money and ran to the bank, or if they really did what they were paid to do? etc. etc? What can you say for sure except that these numbers appeared on the television set? The determination of which precincts to sample is based on a criteria that will hopefully produce a result that accurately represents the populations. In this case, there are 51 populations. The precinct selection was not pre-determined to represent the entire nation. The sampling sizes are based on the necessary numbers to produce a reasonably reliable report, with a MOE, for the particular population in question, the individual states. Pile up all the rocks you want, a diamond they do not make. What are some possible flaws in the methodology that could produce movement in one direction? I'm not asking for arguments sake, I would like to pursue that line of reasoning. I lack the sophistication to start off on my own. Don't you have to use each of the 51 data sets of results individually to calculate the MOE? You have a difference for Ohio, so how many N do you have for that determination, how many for Florida, etc. Do no arbitrarily lump 51 datasets and apply that N to calculate MOE for the datasets. This is flawed. Divide 71,000 by 51 and you have N at near 1400. Expect a MOE nearer to 3 percent (I'm being a little cautious). This is the basis of my sorting in the spreadsheet. Forget all states within this MOE. 17 states remain with greater than 3.0 percent absolute value discrepancies. Call these the suspicious states, and call Jimmy Carter. Here we really have a valid concern. Filter to Exit Poll Difference over 3.0 Percent. Two of these states have a different outcomes that the exit polls predicted. Send Jimmy Carter there. allocated according to population demographics. This is a fair assumption, yes? And I am not referring to state samples per se. My statement was in context of the nationwide vote tally - and Kerry was leading 51-48 by most estimates. Put yourself in the pollsters shoes. Wouldn't you want ALL your sweeps to reflect the population, since you knew that the media would be getting the info? Isn't the purpose of exit polling to determine the voting trend in order to call elections? If the exit poll trend was NOT indicative of a Kerry win, why did the pollsters let the media (who pay them) go ahead and predict a Kerry victory? 42. There are 51 distinct exit polls, for the states and DC. You cannot sum the number of individuals in every poll and then use that amount to determine the MOE for an individual poll. The margin of erron for the Ohio poll is not based on how many people were sampled in 50 other polls. Your method is flawed in this regard. To determine the MOE in the Ohio poll, or the Florida poll at a given reporting moment, you need specific information regarding that particular poll. Without the specifics, it is just a guessing game. My guess is 3 percent. The population mean of the 50 differences between the exit polls and the vote count is -1.77 percent. What are your t-Test results? 17. Did you test the data statistically for any trends? The 2004 exit poll numbers show interesting correlations. How does that compare to 2000? How does this comparison move anything forward? We knew they were different. Can it tell us something we do not already know? Your graphs are probably comprehensible to 5 or 10% of DUers. Would you post the raw data graph first, then your standard deviation comparisons. If you just showed the raw data, people can see for themselves what the correlation is -- they can eyeball it. It makes it real for those of us who took statistics back before electricity was invented, or never took it. I guarantee that many people in Congress, the media and the courts will not grok standard deviation either. Try it, and see if you get more people going "oooooo" and "aaaahhhhh". 23. Here is the raw data. I hope you can see the pattern better now. What the graph says is that only in blue states is the difference greater if the electoral prize is larger, and not greater if Kerry has a bigger lead. The reason to do a statistical analysis on long arrays and to compare sets of long arrays is because people typically cannot grasp the patterns looking at large datasets (excepting gifted autistics). In Cuyahoga County we are analyzing 1400+ precincts for about 20 variables. In New Mexico its 54 variables in 33 counties. Without these summaries and visual tools, we would be befudddled forever. The difference (discrepancy) population mean is -1.772, the population standard deviation of that variable is 1.973. Anyone can download the spreadsheets to get any raw data I use in posts anywhere. it makes even clearer a point that you've made often. To wit: it is certainly possible in any election year to find a few states where exit polls and actual votes don't match well. And that's obvious in 2000. DE, AK, CT, AZ... There will always be the oddball skewed for local reasons. The astounding evidence, right before our eyes, is how MANY states were "off" in 2004, and WHICH ONES. The "smoking graph." Hot damn. I love that phrase! and how much those states matter to the electoral college is just as important! Add to that the fact that a lot of Americans were backing Gore's recount efforts and he had far less to be concerned w/ than Kerry does. THIS election is even MORE inaccurate than the 2000 election! 20. TIA, you rule as always. Here's a question: the states that held reasonably tight to exit polls: traditionally strongholds of particular parties? 37. Only a few deviated beyond the MOE- equally. This it how it should be. In fact 29 of 50 states deviated to Gore, most within 1%. Same for Bush. So we can't make any correlations from 2000, as far as I can tell. But I haven't studied the data in depth. And I won't. The point is to compare to 2000 to 2004. That says a lot right there. The focus should be obvious: FL, OH, NM, NY, PA, etc. Bush needed BOTH FL and OH. Those are the key states to analyze. He stole both. That's for sure. The few big deviations in 2000 seem at first glance to have no geographical or other kind of pattern, so it's not like some group was underweighted in a particular region. It looks to be statistical noise. Since you *want* criticism, though, what was the explanation for the 2000 results for Delaware and Alaska? Small sample size? Now in 2004.... well the picture says it better than I can. I have suspected widespread rigging for some time now. My state is "red" and was never going for Kerry, but the exit polls were off by over 3 points. Most counties use OPTISCAN, and that's what I voted on. May I use your graphic in something I'm working on? With proper attribution, of course. Also, do you know the error % for 2004, 1996, and 1992? You said it the polls in 2000 were accurate within .12% and I was wondering if you had access or knew where to look for the other numbers.